Hobbs, M., & Dofs, K. (2017). Self-Access Centre and Autonomous Learning Management: Where Are We Now and Where Are We Going? Studies in Self-Access Learning Journal, 8(2), 88-101. As mentioned in the foreword to this journal special issue, in 2016, the editors helped organise the 7th Independent Learning Association Conference which was held in Wuhan in November, with lectures from keynotes and other global experts in the field. The main conference title was “Autonomy Within and Beyond the Classroom” and the editors also facilitated a symposium within the conference, “Management of Self-Access Learning Centres (SACs) and Autonomy”. This involved presentations from well-respected SAC managers and researchers from around the world. These authorities had gathered to discuss the past, present and future for SACs. The following article introduces and contextualises presentations given at the symposium and the conference by invited speakers and keynotes. Each of these presenters was offered the opportunity of writing a paper, and those that accepted are included in this issue of SiSAL Journal. Advisors and teachers have a key task of enabling autonomous learning for their students. This is not a simple task, as autonomous learning, and particularly exactly how it can be enabled, assumes diverse shapes and forms in different parts of the world – there is no ‘one size fits all’. Educational systems differ between countries, but they all have educators who are experts in how to teach and learn best in each of these specific environments, and each system has unique contexts of pedagogical histories of teaching and learning. The important thing then, is that learners and teachers everywhere are enabled to become aware of and understand how they can learn best. This could be through gaining a range of tools, techniques and strategies for learning, and having opportunities for learning successfully, either with others or alone. Nowadays, there is a wide range of differently-orientated physical self-access centres around the world, each potentially having a range of differing philosophies underpinning them. However, the centres still all have the same aim of enabling learners as much as possible to be successful with their studies in a range of contexts, especially for self-study outside the classroom, whether this be in a self-access centre or some other place. Many centres around the world are currently undergoing some type of restructure, re-imagining and renewal. These are often placed within a centralised campus-wide support centre, where students typically have one-on-one appointments with academic support personnel rather than self-study in a centre. For this reason, it is useful to re-examine the issues regarding self-access, autonomy, and independent learning in today’s environment. … showing that the lack of autonomy is highly demotivating for humans and goes against the educative grain … Deep learning is only possible with some form of autonomy … Therefore, the whole concept of teacher effectiveness must be reviewed in the light of the need for autonomy. (p. xi). Institutions today face large pedagogical and physical changes, set within an educational environment of more flexible, blended/online teaching and learning models. Therefore, there is a need for educators to be made more aware of the requirements, needs and benefits of learner autonomy. Kolb and Kolb (2005) foreshadowed the situation that is currently apparent in New Zealand and the rest of the world, when they imagined “… a holistic program of institutional development that includes curriculum development, faculty development, student development, administrative and staff development, and resource development … coordinated around an institutional vision and mission to promote learning.” (p. 209). They also believe in other features integral to the new social, learning and spatial developments, such as self-direction and development of students’ metacognitive skills to foster learning and responsibility for learning. As previously outlined by Benson & Voller (1997) and Dofs and Hobbs (in press), simply providing a range of appropriate facilities (such as suitable resources and study space) within the social, learning, and spatial developments in institutions, does not automatically lead to the outcome of student centred learning or autonomy. Some of the desired outcomes of these facilities are: increased self-motivation, more knowledge about how to learn, and more responsibility taken on by students themselves for their own learning. Self-access learning centres, and indeed other support structures within institutions, should scaffold learners and assist them in developing useful strategies so they can perform their own needs-analysis, goal-setting, and decision-making about what and how to learn. These academic support networks also need to help students to select appropriate content, manage their own learning methods and strategies, and give them the necessary skills to self-assess their learning achievements. For this to happen, advice and information about metacognition is imperative, as is a high standard of language learner advising. To allow self-access learning centres and their staff to fulfil their roles, several important areas should be addressed, i.e., social aspects of studying and learning, the evaluation of centres, the role of centre management, how to enable encouragement of autonomy, and looking forward to adapt to what the future may hold. During the last forty or fifty years, autonomy has been developing and moving through several theoretical bases, beginning with learners being thought of as individuals capable of accepting and taking responsibility for all aspects of their learning. After this, a more social interpretation became popular, whereby autonomy was considered in terms of ‘inter-dependence’, rather than simply ‘independence’. Little (1991) observed that merely by being in the same physical space, people are in fact part of an interdependent social situation. We will now give a brief overview of the papers which are included in this special issue. They were presented at the 2016 ILA Conference at Wuhan, China. The first of these, by Murray, describes how complex dynamic systems comprise many interacting components and these can self-organise, thus allowing new phenomena to emerge. In this way, these new phenomena may challenge predictions and work across different levels of organisation, because as open systems they may utilise outside resources. This could then bring about a new set of affordances for learners, new opportunities not necessarily present in the current environment, and these may also only start emerging as the learners interact with their environments. These potential affordances are naturally restricted by the learners’ own perceptions and imagination, and could be indirectly influenced by the discourses surrounding their space. Murray suggests that currently, ethnographic and narrative enquiry is leading academics to research social learning spaces and how managers of these spaces could go about providing affordances and opportunities for learning, as they continue to foster conditions for complex emergence, in either physical or virtual spaces. He explains that complex emergence can be promoted within centres, by staff sharing control with users, facilitating peer interactions that benefit both parties, and preparing the learning space in such a way that these affordances are encouraged. It can also be realised in part by advisors and teachers, through them recognising and capitalising on the ‘teachable moment’ as it arises. Having a choice in their own language learning means the language learner or user taking control not only of the language being learnt, but also of the goal and purpose of that learning … Autonomy resides in being able to say what you want to say rather than producing the language of others … (pp. 59-60). Cotterall further extends this to encompass both advisors and teachers – she describes conference attendance, reading papers, networking, and belonging to an ‘academic tribe’ as being affordances for staff working within the language learner advising discipline. It is important to consider the evaluation of SACs to ensure that they are adequately providing the above-mentioned affordances for students and staff, as well as committing to other learning centre roles. For example, evaluations should also aim to promote both efficiency (good use) and effectiveness (good outcomes). While learning gains may be essential in the evaluation and operation of self-access centres, the measure of this gain, and indeed, autonomy itself, has always been rather problematic, ever since the emergence and growing popularity of SACs around the world. Some of these problems arise because it is difficult to describe autonomy and isolate what variables may be having an influence. However, “evaluating the development of metacognitive awareness in learners is central to any evaluation of autonomy” (Sinclair, 1999, p. 107), and this would call for the development of suitable criteria and scales for grouping and analysing data accrued from learner’s self-reporting. While “The variety of types and scope of learning makes any attempt at its definition, analysis and measurement problematic” (Morrison, 2005, p. 270), later experts also debate the value and authenticity of measuring autonomy (Benson, 2010; Dam & Legenhausen, 2010; Lamb, 2010). They believe the main difficulties involve controlling the variables within the diverse population that make up SAC users. There are also complex and difficult decisions to be made about what the foci of the evaluations should be, and what actual data would be most valuable to try and capture (Gardner & Miller, 2014; Thornton, 2016a). Thornton’s presentation at the SAC managers symposium (Thornton, 2016b) focused on the proposition that there is definitely a greater need now than ever before for reliable research and evaluations to prove that centres can and do offer multiple learning affordances and advances for learners. This is for two main reasons – firstly, to show that dedicated physical language learning centres are valuable investments for institutions financially, particularly at a time when many tertiary institutions are finding budgets decreasing or at least unable to increase in real terms. Secondly, and undeniably more importantly, managers can gain deeper insights about the most beneficial facets of their programmes and activities through research and evaluation. As a result, staff in centres can better meet the needs of the students, and in turn, enable the learners to better meet their own needs. (3) interviews with learners themselves, to allow them to develop insights into their self-awareness, and to enable them to notice and assess their increasing language ability and achievements. For learners to be able to self-assess, they need to have the capacity to control their own learning, and, according to Huang and Benson (2013), three key components need to be present; “ability, desire and freedom” (as cited in Murray, 2014, p. 7). Students need freedom to exercise their desire to use their ability to maximise their potential. This includes an inherent critical need for personal relevance and ownership of the study goals and purpose. Students need to value their studies and take part in choosing what they do – they need to know that whatever they have in terms of class contact time is be used effectively and efficiently “… to teach those aspects of the language which the learners themselves deem to be the most urgently required.” (Nunan, 1988, p. 3). teachers design and implement sustainable and transferable pedagogical strategies for autonomy … (including) … encouraging student preparation, drawing on out-of-class experience, using ‘authentic’ materials and ‘real’ language, independent inquiry, involving students in task design, encouraging student-student interaction, peer teaching, encouraging divergent outcomes, self- and peer- assessment, encouraging reflection. He believes that professional development should be about closing the gap between desirability and feasibility. In his paper included in this special issue, Benson furthers the discussion of language learning beyond the classroom (LLBC) as he stresses the importance of language learning environments and then investigates the ecology of learning. He shows how fully autonomous self-instructed learners (FASILs) outperform classroom-trained learners (CTLs) in several ways. Along with ongoing evaluations, another vital area is the management of SACs, particularly with respect to critical thinking about key tasks that require training for both managers and other staff in the centres. It is clear that the role of the Self-Access Language Learning (SALL) manager has become more complicated since it was first introduced specifically with the intention of managing a self-access centre. The modern role includes elements of both management and leadership … and extends to physical and virtual resources as well as a collaborative role in integrating SALL into taught courses … The role is inevitably one of middle-management squeezed between higher managers and teachers with all the concomitant complications such a role brings (p. 46). Whatever the background and approach of advisors, there is great value in belonging to a community of practice as educators, and it is important to also include students in this community. In particular, it seems to underscore the role of informal learning as an important complement and supplement to more traditional forms of professional development, and highlights the ways in which practice shapes identity and vice-versa. It also suggests a potential wealth of untapped knowledge within communities of practice which, if utilised well, may support better practice, more effective professional development and the advancement of advising for language learning as a legitimate and more broadly recognised profession in the field of language education (p. 293). As mentioned above, there are recognised links between evaluating the learning centre and evaluating autonomy and learning gains. These days, many courses have autonomous learning embedded within coursework, so exactly how to include autonomous learning in curriculum development should also be addressed. The move to integration and embedding is familiar to many SAC managers in different parts of the world, even if they may take different forms. Therefore, it can be argued that institutions need to find an appropriate way of evaluating gains through autonomous learning. … evaluation of the effectiveness and efficiency of the self-access centre requires more than summative reports based on headcounts. There needs to be sharing of good practices, development of a core team which operates as a supportive Community of Practice and a quality “tool kit” of resources for continuous improvement through constant feedback and evaluation. (p. 407). Another notable issue is advisor vulnerability. Echoing and extending Gardner’s discussion of SAC staff workloads, Gao’s keynote address described the twin problems of crisis management, and the contradictions of research requirements on staff, leading to professional vulnerability (Gao, 2016). Teachers and advisors are not merely pawns in the current educational reform process. Gao suggests that lecturers, teachers, advisors, and researchers actually all have a socio-cultural mediated capacity to act purposefully and reflectively through both their own individual and the group collective agency. Through these agencies they can claim the identity they want to become, and the core values of who and what they commit to be in the classroom as well as within a SAC. Another important aspect of autonomous learning is the broad situated context. Examples of this are: the work of advisors and associated affective factors, including the social aspects of status, emotion and socio-cultural theory, and working within a business model rather than a social service model. Teacher autonomy, learner identity, and strategy training may also have an impact as well, as outlined by Dofs & Hobbs (2011). The link between a SAC and the classroom could encompass classroom-taught strategies for autonomous learning awareness which learners can transfer to their out-of-class self-studies. Advisors can be another link and they need to reflect on their learners’ identities (Riley, 2001), which are in part formulated by other people. Therefore, there is always the potential for these others to “… take decisions for us, and even if those decisions are for our own good, there is a risk that we may not approve of them” (p. 174). For this reason Riley states “advisors and learners cannot hope to understand what is going on within the advising situation unless we have a clear idea of the identities of the participants involved” (p. 182). This would also include other social factors, for example, the emotional and psychological investment students have in their own goals and future outcomes. These can affect their sense of belonging, ownership, engagement and autonomy, so it is important for advisors to try to create a learning environment where students want to learn. Zhang reflected in his keynote on how socio-political contexts and situatedness can feed into continuously changing and adapting learner metacognition, which is well known to be a key factor for autonomy (Zhang, 2016). With autonomous learning becoming increasingly embedded within the context of particular courses, new technology, and online teaching becoming more common, and as spaces for undertaking advising are changing, it is important to look forward and ‘imagine’ the future of advising in SACs. Also the advisory roles undertaken by SAC staff need to be reconsidered. Hurd (2001) argues that “in order to be in a position to advise and support appropriately and effectively, it is necessary to address the many variables that exist in any body of learners, including beliefs and attitudes, styles and strategies (p. 135).” Nowadays, and in the future, different modes of advising are needed to cater for open and distance learning environments, such as via emails, as suggested by Altshul (2001). With constant and rapid digitisation of teaching and learning pedagogies still taking place, the topic of advising modes is still being researched (Hurd & Murphy, 2012). They conclude that advisors need to span the distance between one-to-one sessions on campus (an individual approach) and online group sessions, (a collectivist approach). Therefore, learner support has to be responsive and flexible to be able to satisfy the needs inherent in a variety of constantly evolving learning environments. These days it is not uncommon for advisors, in New Zealand at least, to combine practices – they use Skype, Zoom, telephone, Googledocs etc., and/or face-to-face and small group sessions on site. In the SAC managers symposium, Mozzon-McPherson described how Higher Educational learning hubs in England are being set up, where it is expected that self-access centres play a major role in creative learning and innovative teaching (Mozzon-McPherson, 2016). Centre staff are also supposed to investigate autonomous learning within the research community and how this impacts on students’ ability to prepare for their future in a globalised world. In New Zealand, many tertiary institutions are moving to centralised student services, where ‘Learning Support’ networks situated within wider Library Hubs are integrated closely with faculties and student cohorts. Some of these also include discrete language learning centres within the broader academic support centre. The technological environment and rapid communication available to learners and teachers were familiar to many of the centre managers at the Wuhan symposium. This includes utilisation of such modes of learning and teaching as: flipped classrooms, blended learning, web-based learning, massive open online courses (MOOCs), and collaborative learning situations. With the increasing move towards blended, online learning, and distance learning evident in institutions today, there may also be an increasing need for enabling learners to learn how to learn, and to increase their metacognitive awareness, including how to plan and monitor their learning. Paradoxically, while going virtual, non-virtual skills may be more necessary. There is also a viewpoint that social factors in learning may now be even more important in helping encourage student involvement and engagement, to create situations where students help each other to learn enjoyably and effectively. Since Aristotle’s days it has been known that if you want to teach something to someone else, you will first have to learn it very well yourself, thus benefitting both parties. A noteworthy facet within the learner-centred approach advocated and used by advisors for several decades is one-to-one advising sessions with learners, whether this be online or face-to-face. Indeed, the spin-off benefit of building positive relationships was considered one of the most important outcomes of such advising in a recent conference project by Hobbs and Dofs (2016). Advisors from around New Zealand articulated that “The first most important step in any advisor–student relationship was thought to be building a good working rapport with the students” (p. 189). This initiates a framework for social communication which encourages students to reflect on their own learning experiences, identify areas of need, and negotiate their own learning journey with the support of an expert. Advisors can help activate this process through discussion, thereby empowering the learner to develop their own belief systems and thoughts about autonomy and independence. This input could maybe even inspire learners to change the way they choose to have responsibility for, and take control of, their learning. As Wayne Dyer famously said: “If you change the way you look at things, the things you look at change” (Dyer, n.d.). Through ongoing assistance and support, learners are nurtured within learning centres so they can be successful in their studies and have the autonomous knowledge and skills to manage their own learning effectively and efficiently, particularly when they are not in formal classroom teaching settings. 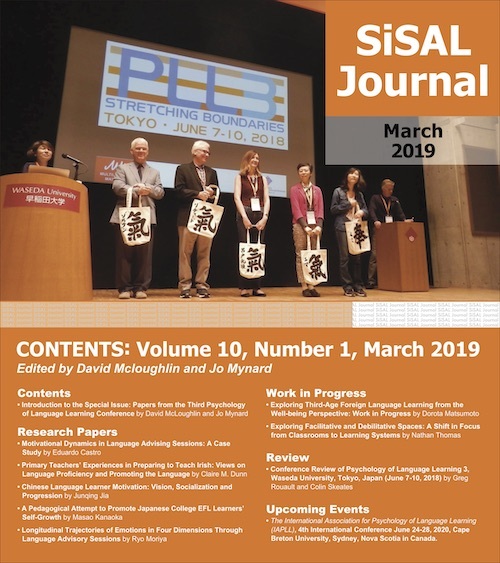 Through reading the papers in this special edition of SiSAL Journal, the editors hope that you will discover that SACs around the world are faced with similar challenges and that they have met these in a variety of different ways while experiencing continuous evaluation and transformation, either internally driven by the learning centres themselves, or externally driven, due to institutional imperatives. Whatever the reason for these transformations and changes of practice, they create a rich variety and depth of autonomous learning support for an increasingly diverse student population. Kerstin Dofs manages a Language Self Access Centre (LSAC) at Ara Institute of Canterbury. She has a Master of Arts in Language Learning and Technology, through the University of Hull in The UK. She is now undertaking PhD studies through the Linguistics Department at Macquarie University in Sydney. Her research interests are around self-access centres, autonomy, adjustment and study abroad. Moira Hobbs has worked within the education field for many years, the past seventeen of which have involved developing and managing a Language Learning Self-Access Centre at Unitec in Auckland, New Zealand. She has an MA(Hon) and her research interests encompass self-access and self-access centres, autonomy, and language learner advising. Altshul, L. (2001). Advising by email. In M. Mozzon-McPherson & R. Vismans (Eds. ), Beyond language teaching towards language advising (pp. 161-170). London, UK: Centre of Information on Language Teaching and Research. Benson, P. (2016, November). Teachers’ perspectives on autonomy and professional development. Paper presented at the 7th international Independent Learning Association Conference, Huazhong University of Science and Technology, Wuhan, Hubei, China. Benson, P., & Voller, P. (1997). Autonomy and independence in language learning. London, UK: Longman. Dam, L., & Legenhausen L. (2010). Learners reflecting on learning: Evaluation versus testing in autonomous language learning. In A. Paran & L. Sercu (Eds. ), Testing the untestable in language education (pp. 120- 139). Bristol, UK: Multilingual Matters. Dofs, K., & Hobbs, M. (in press). ‘Spaced out or zoned in? An exploratory study of spaces enabling autonomous learning in two New Zealand tertiary learning institutions’. In G. Murray & T. Lamb (Eds. ), Space, place and autonomy. Oxford, UK: Routledge. Gao, A. (2016). Language teacher agency and identity commitment. Paper presented at the 7th international Independent Learning Association Conference, Huazhong University of Science and Technology, Wuhan, Hubei, China. Gardner, D., & Miller, L. (2014). Managing self-access language learning. Hong Kong: City University Hong Kong Press. Huang, J., & Benson, P. (2013). Autonomy, agency and identity in foreign and second language education. Chinese Journal of Applied Linguistics, 36(1), 7-28. Hurd, S. (2001). Managing and supporting language learners in open and distance learning environments. In M. Mozzon-McPherson & R. Vismans (Eds. ), Beyond language teaching towards language advising (pp. 135-148). London, UK: Centre of Information on Language Teaching and Research. Hurd, S., & Murphy, L. (2012). Learner contribution in an open and distance language setting. In J. Mynard & L. Carson (Eds. ), Advising in language learning: Dialogue, tools and context (pp. 213-230). Harlow, UK: Pearson Educational Ltd.
Kodate, A., & Foale, C. (2012). Communities of practice as a source of professional development in advising for language learning. In J. Mynard & L. Carson (Eds. ), Advising in language learning: Dialogue, tools and context (pp. 279-295). Harlow, UK: Pearson Educational Ltd.
Macaro, E. (2008). Learning strategies in foreign and second language classrooms. London, UK: Continuum. Mozzon-McPherson, M. (2016). The future of SACs. Paper presented at the 7th international Independent Learning Association Conference, Huazhong University of Science and Technology, Wuhan, Hubei, China. Murray, G. (Ed.). (2014). Social dimensions of autonomy in language learning. Basingstoke, UK: Palgrave Macmillan. Nunan, D. (1988). The learner-centered curriculum. Cambridge, UK: Cambridge University Press. Raya, M. J., & Vieira, F. (2015). Enhancing autonomy in language education: A case-based approach to teacher and learner development. Berlin, Germany: de Gruyter Mouton. Riley, P. (2001). The learner: Self-made man or man-made self? In M. Mozzon-McPherson & R. Vismans (Eds. ), Beyond language teaching towards language advising (pp. 173-183). London, UK: Centre of Information on Language Teaching and Research. Sinclair, B. (1999). Wrestling with a jelly: The evaluation of learner autonomy. In B. Morrison (Ed. ), Experiments and evaluation in self-access learning (pp. 95-109). Hong Kong: HASALD. Thornton, K. (2016b). Evaluating SACs. Paper presented at the 7th international Independent Learning Association Conference, Huazhong University of Science and Technology, Wuhan, Hubei, China. Zhang, L. (2016). Promoting learner autonomy as a dynamic metacognitive enterprise: Context, culture, and strategic endeavours. Paper presented at the 7th international Independent Learning Association Conference, Huazhong University of Science and Technology, Wuhan, Hubei, China.